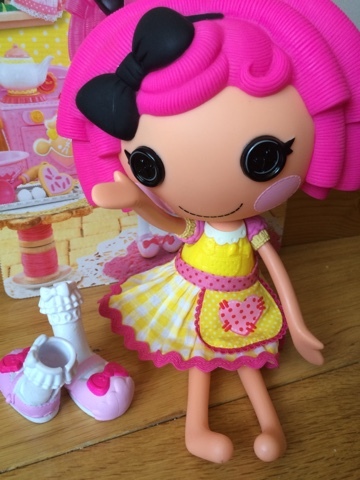 Crumbs Sugar Cookie is the best baker in Lalaloopsy Land! She loves to start her day by baking all her favorite treats. All of her friends love going to her for her yummy baked cookies. She finds most problems can be solved by quickly popping something into the oven. This time Crumbs Sugar Cookie™ is preparing for her next tea party. Her friends always love her sweet creations. Guess what’s her secret ingredient? Love! 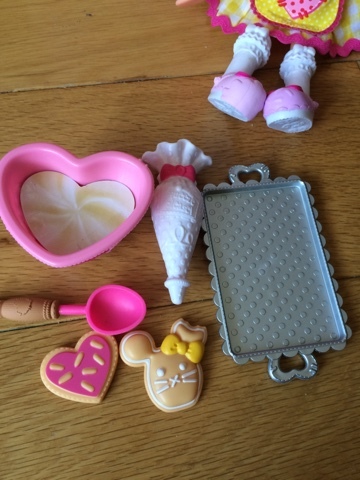 She has her signature accessories which includes: 1 baking tray, 2 cookies, 1 piping frosting bag, 1 mixing bowl and 1 spoon. 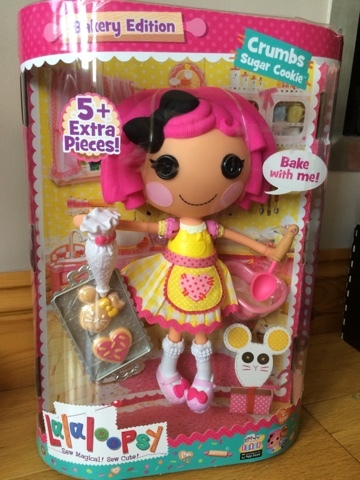 My daughter, Maegan (age 4) absolutely loves Crumbs Sugar Cookie - her very first Lalaloopsy doll, She's very colourful and has a lot of sweet detailing that makes Lalaloopsy very appealing to children. We were impressed by the baking accessories that came with Crumbs Sugar Cookie, Maegan really liked pretending to nibble the bunny biscuit. 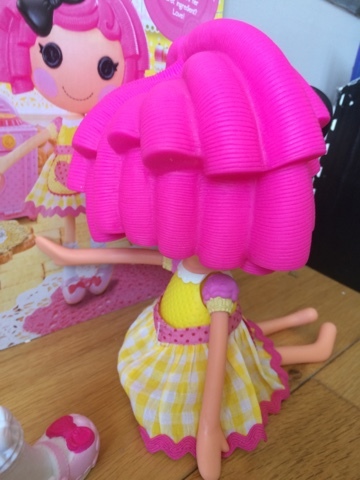 Lalaloopsy has a big heavy head compared to the rest of her which can make her a little tricky to stay sitting up right. She has a friendly happy smiley face and Maegan loved he stitch details. 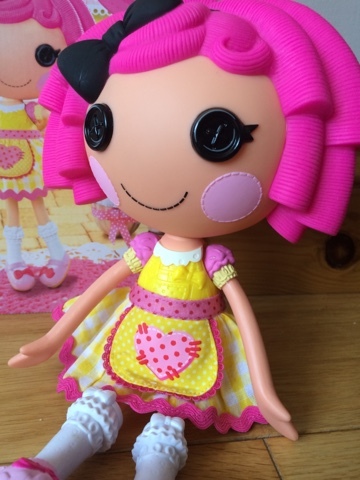 Lalaloopsy Crumbs Sugar Cookie has a removable fabric skirt and rubbery shoes, her arms and legs are articulated so you can change her pose. Did you see the shock of bright pink hair? All curls and secured in a big bow! 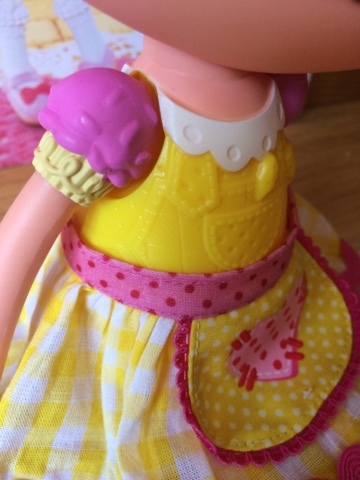 Maegan loves the detail on the cupcake shoulder and has requested this dress for herself! Well thats a challenge for me I guess! 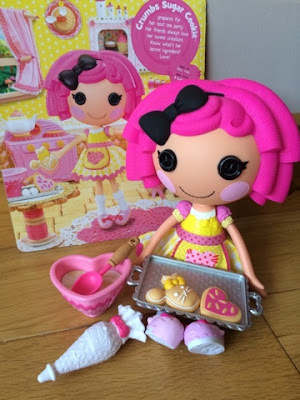 Because Lalaloopsy Crumbs Sugar Cookie is solid plastic, she's really simple to keep clean - yey! 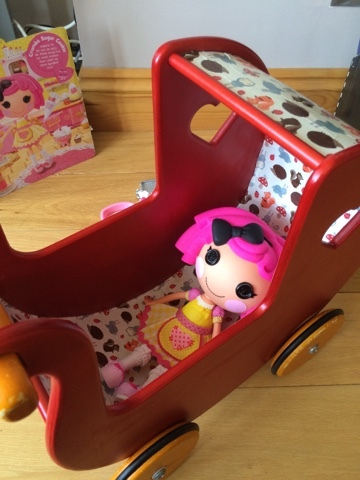 And time for a nap, Lalaloopsy Crumbs Sugar Cookie is the perfect size for Meg's dolls prams. Overall? A big hit with Meg, I'd been trying to steer her away from Lalaloopsy because they remind me of that Coraline film, but it's great to also be reminded that obviously my 4 year old is not going to be watching that film and for her, well, she just absolutely loves this doll and it has everything that appeals to small people, Meg is already eyeing up other dolls in the range as well as the Build a Bear Lalaloopsy's! Disclaimer: I received lalaloopsy crumbs sugar cookie for my consideration, all thought, photos and link choices are my own. Coraline is one of my girls favourite films and when they saw this range, they said "Oh no, the other mother got them!" LOL!